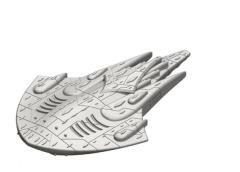 At 225 points the Manta is costly, but then again it is a massive addition to the Aquan Prime fleet structure. Manta is a mainline fighting vessel, seen as a replacement for the current Battleship, bringing a real punch to any combat situation. One of the strengths of the Manta is the ability to carry up to 9 fighter wings, which when combined with its overall improved firepower makes the ship a potent upgrade for Aquan Fleets. A Manta model is 132mm long and 91mm wide. All models come with clear acrylic flight stands.